Toshiba Corporation's (TOKYO:6502) Storage & Electronic Devices Solutions Company today announced the launch of two new ICs, “TC3567CFSG” and “TC3567DFSG,” that match industry leading  low current consumption realized by previous products while offering an enhanced security function. The new ICs are the latest additions to Toshiba’s line-up of ICs supporting Bluetooth® Low Energy (LE) ver.4.2 communications. Sample shipments start today. The new ICs, like previous products, realize a peak current consumption of 3.3mA at 3V voltage supply in transmission mode by adopting a highly efficient DC-DC converter and an original low-power circuit design. They are also able to acquire a random number with a length of up to 32 bytes, using a random number generator, newly incorporated as hardware, a function that will help to strengthen the information security of IoT products. 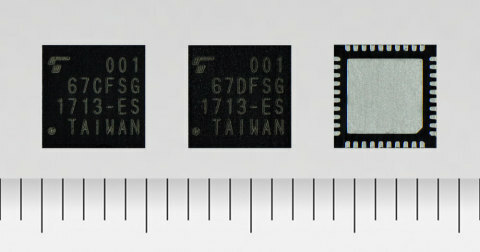 “TC3567CFSG” incorporates of 128KB Flash ROM for storing user programs and various data in stand-alone operations, and can execute an approximately 50KB application program at maximum. As in the previous products, integration of an RF matching circuit and crystal load capacitors for a clock generator reduce the external component count during IC design, and in the minimal case only seven components are required for set development. This contributes to reductions in cost and mounting area. “TC3567DFSG” has no built-in Flash ROM and achieves extremely low current operation by reducing the current consumption required for access to Flash ROM. This allows it to achieve long operating times for applications powered by small coin batteries. For example, using a CR2032 type coin battery, the new IC can carry out beacon operation for over two years. The new ICs will facilitate adoption of Bluetooth® LE communications for IoT products that require a high level of security, including wearable devices for healthcare applications and high-grade small devices that use coin batteries, such as sensors and toys. They will support set makers in optimizing product value. Bluetooth® Smart devices, such as wearable devices, healthcare devices, IoT products that support information security, remote controllers and toys. : Products with the same ratings, as of May 31, 2017. Toshiba survey. : Compared to Toshiba’s “TC35678FSG”. : Low-power-consumption-communication technology defined in Bluetooth® ver.4.2. : Length of battery life depends on the transmission interval time of beacons. * The Bluetooth® word mark and logos are registered trademarks owned by the Bluetooth SIG, Inc. and any use of such marks by Toshiba is under license. Other trademarks and trade names are those of their respective owners. * ARM and Cortex are registered trademarks of ARM Limited (or its subsidiaries) in the EU and/or elsewhere.